Two years ago TODAY, August 27, 2008, I began the celebration of my 50th birthday at the Primary Chiropractic Center in Manchester, Missouri. It was there that an Applied Kinesiology and Brain Integration Technique Professional confirmed in the spoken word what I have instinctively known all my life. I am a twin! My twin sister’s name is Joy. We are identical female twins, both redheads, I am the savior/caretaker/protector/leader…Joy is the introvert who loves mint ice cream. (well, Joy can be quite spunky and boisterous, too, when she wants to be ; - ) ). Today is August 27, 2010 and today I learn to stand on my own. I am no longer a wombtwin, I am, today, for the first time in my life a WOMB TWIN SURVIVOR. What is the difference, you ask? Joy is gone, I AM HERE! I will move on with my life from this day forward as ONE INDIVIDUAL, alone, a little sad, and yet peaceful in a way I do not yet fully understand, and that is okay! My birthday cake today will be a ritual sending off party for my beautiful sister Joy, whose memory is now honored and recognized on the IN MEMORIAL page of the WOMB TWIN WORLD website. I will always and forever be a twin. I will always and forever love Joy. But today I become ME, JUST ME! My Birthday cake will be a symbol as I will begin the day with TWO sets of candles –TWO 5’s and TWO 2’s on my cake. I will end the day with ONE set of candles, MINE! And to help concretize the moving on of Joy and the wholeness and new beginnings for me, the open "wound" on the top of the cake from the REMOVAL of the second set of candles will be lovingly and wholistically filled with new and fresh and beautiful icing symbolizing the new wholeness that is ME! ME, ME, ME, ME, and oh by the way, ME !!!! My dearest Jo-y, as we say goodbye to one way of “knowing” each other and enter into our new way of “knowing” ourselves, may I say it has been difficult to love both of us and live for both of us. I need my freedom now, oh sweet one, to live the rest of my life, alone. I will always remember you but I shall no longer take care of you. You do not need that from me. It is I, as the survivor, who needs the care now. Your role as my sister is not eliminated, only changed. You live in heaven. I live on earth. That is our reality. I know that now. It is time to live that reality . And so to you, my dearest Jo-y, I dedicate this 52nd birthday. And to ME, Josephine, I CELEBRATE this 52nd Birthday as the first day of the rest of MY OWN LIFE. Peacefully, lovingly and with IMMENSE love, I wish glory and fulfillment to us both, each in our own ways, each in our own worlds. I love you Jo-y and I must let you go. You are FREE today and SO AM I. Is there any better gift? For today, I see nothing more beautiful and glorifying than to FREE you to God and FREE ME to survive and thrive on earth to love and serve others and myself. It is my calling and so I shall follow it. HAPPY BIRTHDAY TO US! Today My REAL, EARTHLY, WOMB TWIN SURVIVOR LIFE BEGINS IN A NEW WAY. I am ready! Love you ALL so very much, I could NEVER have come to this moment without YOU by my side. My journey to being a twin was interrupted when my twin died and completed when I found Wombtwin Survivors. The pieces of the puzzle were collected over a period of about 30 years; from a question from my mother when I was on Maternity secondment, to a vision of my twin's death, to reading Althea's work. The pieces just all fell into place; my soul knew the truth and the truth set me free. My work as an Aman Cara takes me into many of the nooks and crannies of the soul....of others....so understanding some of my own is revealing to say the least. I knew I was searching for something........but what? I knew I was different to everyone I know......but why? I knew I wanted relationships which were deep, intense and personal........but why doesn't anyone else? I knew I would never know.............but I was wrong. I am a twin. My brother died before we were born. I am not alone there are others like me and they too want the kind of relationship I want. I have already felt connected to Althea, like a big sister, and Andrew, in Ireland, like a brother. I have other 'siblings' out in the world. Men and women who lost their twin before they could even know them; but they did know them and that makes life very confusing. The New Testament of the Bible was written in Greek and translated into English. English is a very limited language in many ways and the translators translated two Greek words with one English word......"know". The two Greek words mean...'to know intellectually' and ....'to know by special relationship'. We did not know (intellectually) our twins, but we did know (have a special relationship with) them. Listen to your heart and follow your peace. You are not alone. It sure has been hot (35 degrees celcius yesterday) in my little part of the world. For this time of year, almost record breaking. Don't get me wrong , all year round , I look forward to the summers heat. Especially in the winter when the snow is almost waist deep. Living in the desert of B.C. sure has taught us how to manage the day to stay cool. The windows covered in the heat of the day, to keep the heat in the house to a minimum. A/C on maximum, fans a blowing in every room that has no A/C. The dangers of a hot summer, is evident all around my Beautiful British Columbia. In the air a haze as the smoke rises from the forest fires as they change the landscape. When I was a kid, I remember those dog days of summer differently. The world seemed alot cleaner, fresher some how. Yes, summers were hot and spent splashing around a pool somewhere. Endless lazy days spent baking in the hot sun on a towel, day dreaming about my twin, listening to the radio. Days so hot you couldn't wait for them to end. Enjoying those balmy nights listening to the crickets sing their song. When you just wanted the season to change for the cooler temperature. The second it cooled off, you would feel that sick feeling in the pit of your stomach knowing that back to school would be just around the corner. School was a very difficult experience for me. It was the place where I became painfully aware that I was very different from everyone else. I was missing my twin, I was undiagnosed dyslexic, I had a definate learning disability, on top of all that, from chronic ear infections I was/am hard of hearing. I became a master lip reader and faked my way through. I did not fit in, square peg, round hole. I did not understand what was going on half the time. I had very few friends, no confidante. My coping mechanism was to go off in my own little world. The world where it was Michael and I. We were together, and it was me and him against this big, crazy world. In the hot, dog days of summer we would play, sun up to sun down. Only going home for food. Michael, Rocka (our golden lab) and I would chase the horses, bare footed with only our bathing suites on. Running the in back field (paddock), pretending we were running with our pack of wild mustangs. Or we would hang up side down in the cherry tree, head to head, quietly giggling, spying on who ever was down below. Or we would fall asleep under the stars, listening to the quiet sounds of summer. Safe, secure, loved, and understood! Where I was no longer ALONE, AFRAID, and HURTING. The way be would have been, if this was the perfect world of my dreams. Thank-you Althea for this forum to share... Live in Peace and Peace Will Live in You! Althea and I (Sylvia) did an interview recently about my latest book just out called A War Of Her Own the story of a young woman during WWII who is a womb twin survivor. Although fiction, this story is loosely based on my mother and her family during that time period. I asked for the privilege of posting the interview here in case the story might strike a chord with our blog readers. Althea: Hallo Sylvia. I am delighted to see that you have included a womb twin survivor in your novel. As someone who works with womb twin survivors I am always pleased when someone mentions it. How did this idea come to you? Sylvia: Hi, Althea, and thank you for allowing me to talk about my newest book A War Of Her Own. I do believe this story will speak to womb twin survivors—it spoke to me, and I am one, too! Actually, the writing of the work greatly facilitated my healing. A War Of Her Own is set in my hometown of Orange, Texas. For those of you who don’t know Texas, Orange is just a few miles from the Gulf of Mexico—where hurricanes are want to blow and mosquitoes—lots of mosquitoes—grow as big as dragonflies. Not really, but at times they seem like they're that big, but a lot more ferocious. The Sabine River separates Orange, Texas from southwest Louisiana—Cajun country. 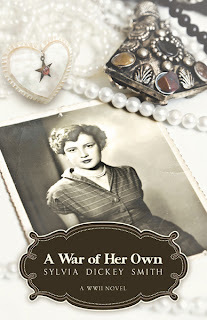 A War Of Her Own is set during a fascinating period—World War II, when the small town’s population exploded 700% almost overnight when local shipyards gained contracts with the Department of Defense to build warships such as destroyers, destroyer escorts, landing craft, tugboats and the like. People still suffering the backlash of the Great Depression flooded the town for the jobs there, now for the taking. Soon, all hell broke loose. Society and culture changed right before people’s eyes. Women took jobs previously performed by men--and did them well! Many families slept in rented “hotbeds”—beds still warm from the body of the person who just arose and went to work at shipyards working around the clock. War housing was built over night on river sand pumped in from the river bottom. Before I started the book, I knew it would be a story told through the eyes of a woman. The title, A War Of Her Own came to me before the plot. The rest of the story unfolded as I wrote the first draft. Althea: Did you imagine one of your characters as a womb twin survivor right at the start or did it kind of creep up on you as an idea? Sylvia: It crept up on me. I’ve always been fascinated with that period of history, particularly the effects it had on my hometown and my family. My parents lived in Orange during that time period and I remember so many stories I’ve heard over the years about what life was like. I’d tuck those ideas away, pull them out and work on the project for a while. Then I’d stall over the hook and put it aside. I knew my character, I knew my setting, but I didn’t know why she was so sad. Many stories revolve around family secrets, but I didn’t know hers. Then several elements in my life clicked and the whole idea of writing a story about a womb twin survivor cemented itself in my psyche. I picked up the story again and didn’t stop until I completed it. Althea: Fascinating. Now do you think that (your main character) was molded by this early experience in any way? Sylvia: Oh, absolutely. I think that because I believe I am a womb twin survivor. I was born many years before there was such a thing as ultra-sound. However, I spent many years crying myself to sleep at night, feeling like I lived in a half-empty womb—a womb both a graveyard and a birthing chamber. Then, several years ago I stumbled on your website and recalled hearing my mother talk about one day during the early stages of her pregnancy with me. She stood at her ironing board ironing when a gush of blood poured down her legs and into her shoes. Another day, my sister told of once when she, Dad and Mom went to a local carnival and as soon as they stepped onto the fairway, blood again started pouring down Mom’s legs and they had to go home. Both times, my mother thought she had miscarried. Either that, or her period had just been late. She did not go to a doctor, which was common in those days. Later, she realized she was still pregnant. Althea: Did you have to do much research to make sure you got it right or did you draw your ideas from your personal experience of being a womb twin survivor yourself? Sylvia: Yes and no. My research about womb twin survivors is told from personal experience, confirmed by what I’ve learned from you and other websites on the topic. My research included the historical aspect of the era. What it was like for women who went to work as a riveter. For the symptoms of the womb twin survivor, I worked from personal experience. I know there is much more to the effects of being a womb twin survivor—much more than my experience. But I wanted to keep this simple and clear as an introduction to the subject. I know many people have never heard of it, and many could benefit from an introduction. Nice, slow and easy. I also wanted to show how insidious the syndrome can be and how it can effect our lives in subtle, yet still overpowering ways that end up making us dysfunctional without realizing the grief we carry--sometimes at an unconscious level. Althea: Now that you have started on this topic do you have any ideas for further stories that may involve womb twin survivors? Sylvia: Actually, a fan suggested I continue with this story, making it a series. The suggestion was to write the next step in Bea’s life—A Life Of Her Own and the third, A Love of Her Own. Who knows? Depends on my muse. I do know this topic will continue to grow. I have been encouraged by those who read the advance reading copies, and of their interest in the topic. My hope is this tale opens up the subject for common discussion. It is a syndrome that impacts our lives more than many realize. Hopefully WT members will read this work and learn from it, and refer the book to others. 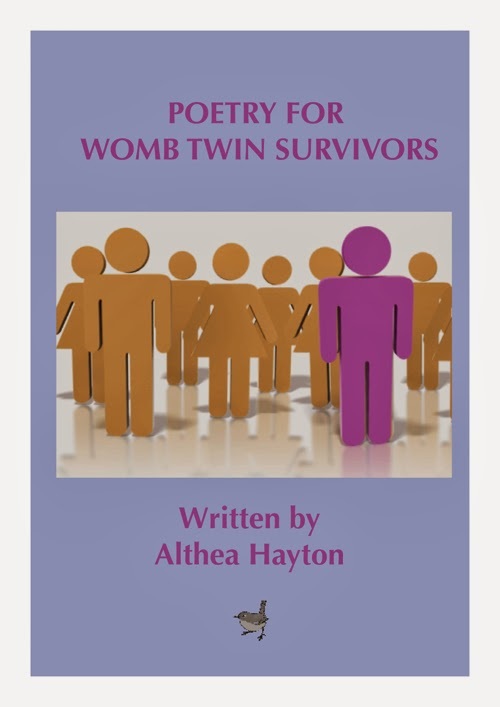 Also, Althea, because of my commitment to Womb Twin Survivors and the work your organization does to help other, for every book sold through Womb Twin connections, I will make a $1.00 donation to the organization. All a buyer need do is to let me know when and where they purchased the book. I can be reached at sylvia@sylviadickeysmith.com. The book is available or can be ordered online and brick and mortar bookstore. Folks with a U.S. shipping address can order an autographed copy of the book for my website at A War Of Her Own. Althea: Thank you, Sylvia, for your generous contribution. We wish you good luck. Sylvia: Thank you for letting me share a part of my healing journey here on the blog and for all your effort at helping others. As a womb twin survivor who's pretty much "done" in terms of healing, next week I'm giving everything up (lncluding food & personal hygiene!) to do a week long retreat. Will be living on a diet of low glycaemic juice, doing minduflness excercises & enduring enemas, compensated for by having massage & walks in shady woodland! Whatever happens as a result of this week away is ok as I've let go of attachment to any outcome for my life; instead I'm open to what I'm called to do. This seems like stepping off the "floor of familiarity" into space, trusting that I'm looked after & that Divinge Guidance is there. My job is to listen & be still enough. When we are slow down & are still, that's when magic can enter our lives. There is a brilliant quote about one of our greatest causes of unhappiness being unable to sit still & alone with ourselves. As we progress along our healing path, that's most definitely true. On the womb twin web site we have created a special place for every one of you to create a virtual memorial plaque for your womb twin. Each one looks like a little image sitting on a web page, barely visible, but when you click it it will enlarge as big as you want it, so you can see all the details. A wonderful metaphor for the way that your lost womb twin seems so insignificant to the casual disinterested observer, so that that no one believes such an early loss can possibly matter at all. It's not until we take a REALLY close look, that we are able to see all the details - then the true extent of this loss is made visible. It takes about a week for your special memorial to be created; there is a whole gallery of special images to use, or you can create your own image and send it to us. All it takes is a donation to WombTwin.com and your memorial plaque will be up there for all the world to see. It's just a trickle at the moment, but soon there will be hundreds..... It's here. Take a look for yourself. My name is Jo. My womb twin is Joy Elizabeth Sarah. She was absorbed into my body as a teratoma and surgically removed on April 5, 1989. That made for a horrid memory of a funeral for my sister. I have been "percolating" in the world of my womb twin and very confused for a long time. I had my teratoma confirmed as a womb twin in 2008. (on the exact date of my 50th birthday...August 27, 2008) Since then I have baptized her, bought both of us toys and treasures, and been completely obsessed with her. I would like mint ice cream for my birthday. What happened for me is that I broke loose tears from a long time waiting. After Sunday, and the new release of grief, I connected immediately back to my homeground with Womb twin.com. I started blogging on the Womb Twin USA site and had the complete honor of talking to Monica over Skype. (that conversation was yesterday, August 9, 2010). TODAY, August 10, 2010, one of my adopted daughters was attempting to give birth. She ran into complications and the family engaged me as a prayer warrior. I did pray and I also asked permission to do distance Reiki. As I was praying for Ashley and her C-Section birthing of her baby Camryn, I felt called to image my opening up of my own of my abdomen where Joy, my wombtwin, resided for 30 years with me. As I continued to send Reiki to Ashley I too received a blessing. I felt my abdomen shrink into nothing and where my midsection scar remains from my surgery in 1989 feels like it is sunken in tissue and all shriveled up on either side of the scar. Joy is free, she is not mad at me for letting her go and I am going to just sit with this new event to see where it takes me. Reiki seems yet another wonderful tool to help us heal and deal and feel our wombtwin world. Submitted with love, respect, humility and intense gratefulness. Goodbye JOY, from my abdomen and HELLO JOY to my world of memorial. Yesterday I said goodbye to my fraternal boy twin. It was a most amazing spiritual and significant experience--words can't quite do it! Accompanied by my friend Monica, I had THE MOST incredible farewell ceremony for Carl! I had decided three days earlier that I needed to say goodbye. We were done, it was over, and I was ready to move forward, and rapidly. The night before, I still had no idea how I wanted to say goodbye, but knew there was nothing tangible about him so there was nothing to tear, bury, burn, caress, hold. In the morning we bought lots of very healthy food for my house, to nourish myself, and one nice loaf of bread for Carl ("Old World Bread with Caraway (care-away!) Seeds"). We drove to a beautiful white, sandy beach in Connecticut on Long Island Sound, in perfect weather--sun, a nice breeze, clean white sand and wonderful beachy air. After hours of relaxing, sunbathing and dipping into the water, we decided it was the right time to say goodbye. As I was singing a song I chose in preparation for letting him go, two birds approached our blanket and sat in the sand, waiting. There was no time to finish that perfect song. They were not going to leave--NOW was the time! I jumped up, went to the edge of the water, and started throwing bits of bread. All the birds in the area heard about the free food and descended, eating happily as I was saying goodbye to Carl, running and dancing along the shore, laughing, throwing the bread, and watching all the LIFE that came to me as I was saying goodbye! I was nourishing living animals and giving Carl back to nature. Saying goodbye to one feeble dead being brought huge, happy, appreciative life to me, and even if it was for a short time (until the bread was gone), it was so symbolic of being a magnet for much more life ahead, by letting go of one little life that was keeping me back. PS Some of the birds lingered with us, sitting and resting on the sand with full tummies! Did YOU hold a ritual for your twin? Let us know what it was like, it is always a wonderful and uplifting story. I was wondering yesterday - let's make an IN MEMORIAM page on the main Womb Twin web site for womb twins from all around the world. It would make an amazing public statement to see dozens - probably hundreds - of memorial plaques up there on the net! I thought of a scheme where a womb twin survivor, for a small fixed sum donation, could choose to send a special image to Wombtwin.com HQ (or select from a set of images already provided) with their name, their twin's name and a few words (no more than 6 words in fact) and we at HQ could create a little plaque that could go on the page and be there for the world to see, for as long as that person wishes. Here is a rough example of what the page could look like (click the link here to see a experimental sample page) - if you click each little memorial image then you will see an enlarged version in a small window. What does everyone think of this idea? Is that the way to do it? Ideas please. What could we do about triplets? Feedback, ideas and comments please! Is this relevant for you, too? After watching Shadowlands on You Tube this evening, this video "appeared" - & certainly was the right thing to be in front of my eyes! Maybe it will be of help to you, too. Please be aware that it's ok if you're not ready to forgive &/or find it hard to forgive. It doesn't matter whether its yourself, others or both - just accept where you're at & ask for help in forgiving - note the line in the video about it "flowing through". Hope you find it of value.